Gradual compression, micro massaging, and the secure, comfortable fit of the Giordana NX-G Cycling Bib Short is achieved through the new 1on1™ Paneling System. The longer leg length combined with the compression inherent to the fabric also eliminates the need for leg bands. The double woven V-shaped core and U-shaped back panel systems provide breathability, moisture management, and stability through the waist and upper back. The minimal elastic and perforated bib straps keep you cool and dry with two levels of stretch to fit perfectly while riding and standing, and further keep the short and new Cirro S chamois in place while riding. 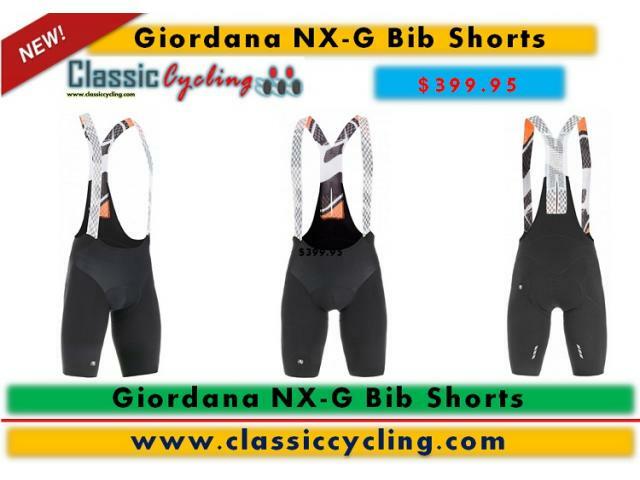 The new 1on1™ Paneling System, one piece of fabric per leg, and a proprietary compression material introduced in the Giordana Cycling Bib Short provides progressive gradual compression for each section of the leg and gluts and an ergonomic and comfortable fit. This unique construction method also eliminates unnecessary seams.